It’s that time of year again. Halloween means trick or treating and donning costumes. Some may remember the times you had as kids, going out in the neighbourhood, getting candies and sweets and some scares – generally suitable kids stuff. 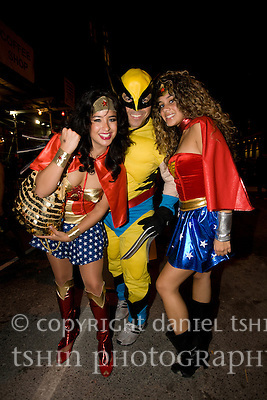 And when you’ve thought that as adults you’ve outgrown Halloween, you’d be absolutely wrong, especially in New York. It’s in New York where adults take costumes (and the trick and treating) to a whole other level. Costumes are outlandishly creative and elaborate, and apparently the carousing/costume parties that go on afterwards are of legend. Monday night will be host to the annual Village Halloween Parade (wiki article), the largest Halloween festivities in the US of A.
I’ll try to get in this year and take some photos, but the last time we were here (in 2007), we had a chance to see it with our own eyes. You’ve been warned that some are hilarious and some intended to shock. For a taste of what you’d see, check out the photo gallery. This entry was posted on Monday, October 31st, 2011 at 12:56 pm. It is filed under New York and tagged with Halloween, New York, parade, Village Halloween Parade. You can follow any responses to this entry through the RSS 2.0 feed.